As noted in my post of May 20, we recently spent a weekend in Madison, Wisconsin with friends, and did some cooking and relaxing together. 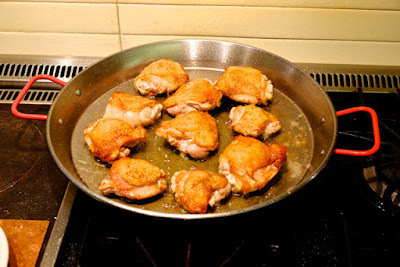 I made Roast Chicken with Sumac, Za'Atar and Lemon using their wonderful paella pan. 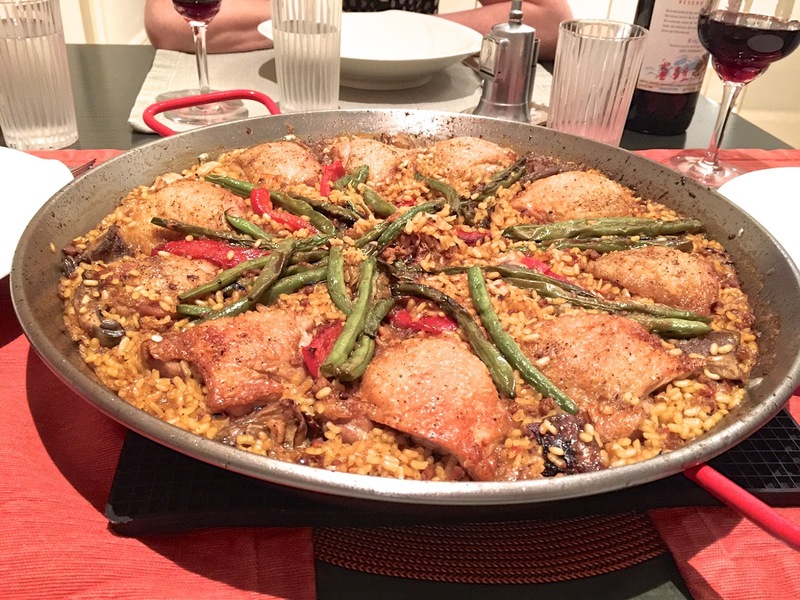 I immediately developed a case of pan envy, and upon returning to New York, ordered my very own, a genuine classic carbon steel one from a maker in Valencia, the home of paella. 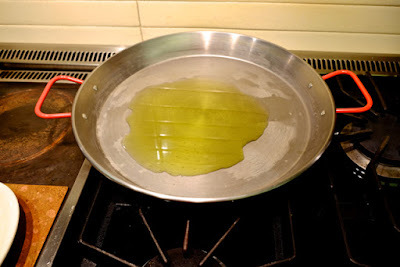 By the way, "paella pan" is technically redundant, since paella refers to the pan as well as the dish, but I'll go with paella pan to avoid confusion. Last night I broke it in, and served a completely Spanish meal for some good friends who are willing to share my experiments in the kitchen. So here's my virgin pan, with four tablespoons of olive oil, just waiting to get to work. I chose to do a classic chicken paella, following the recipe that accompanied the pan, except that I added a little (1/4 lb) chopped fresh chorizo to the grated onions and tomatoes that formed the soffrito, the flavor base for any paella and many other Spanish dishes. First the chicken. After that's done, I sauteed slices of fresh artichoke hearts and a red bell pepper, then put them aside while I made the aforementioned soffrito. Finally the rice is added, together with chicken broth that was flavored with some excellent precious saffron that I bought over the Internet, first toasted and then infused in a bit of broth. 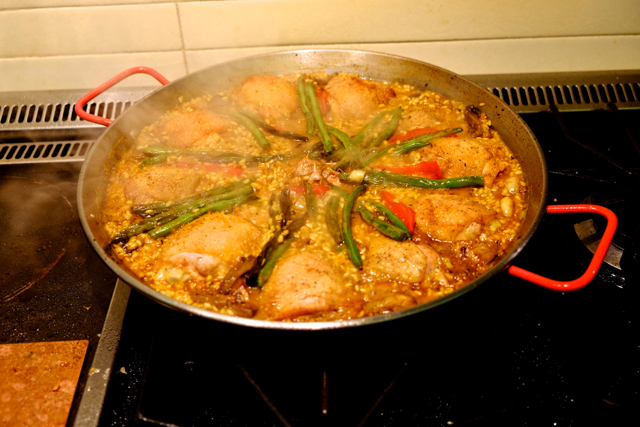 The chicken and vegetables are placed on top, arrayed as attractively as possible. For about eight minutes, the rice is cooked at a fast boil, until the broth is reduced to the level of the rice. Then the dish is brought to a low simmer for the final cooking. 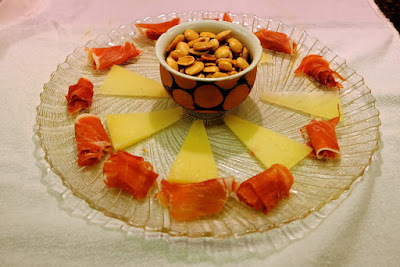 To stay on the evening's theme, I started with a platter of great Spanish products: Serrano ham, Manchego cheese and Marcona almonds, accompanied by some lightly cured (but not Spanish) green olives. 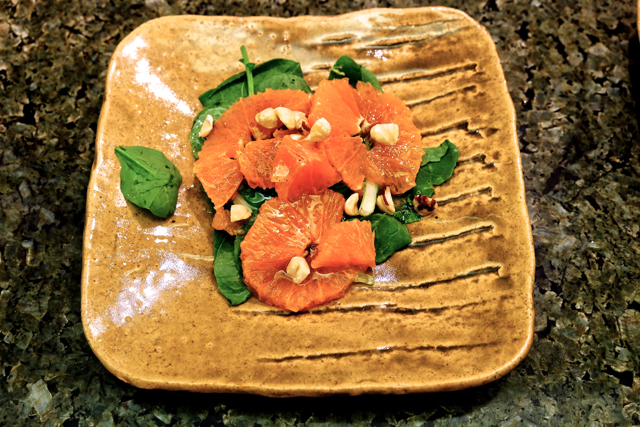 Next, a simple salad of orange slices atop a bed of spinach with seasoned hazelnut oil and chopped hazelnuts. Finally, after the paella, a walnut cake with Spanish brandy, using the recipe from Claudia Roden's excellent The Food of Spain. 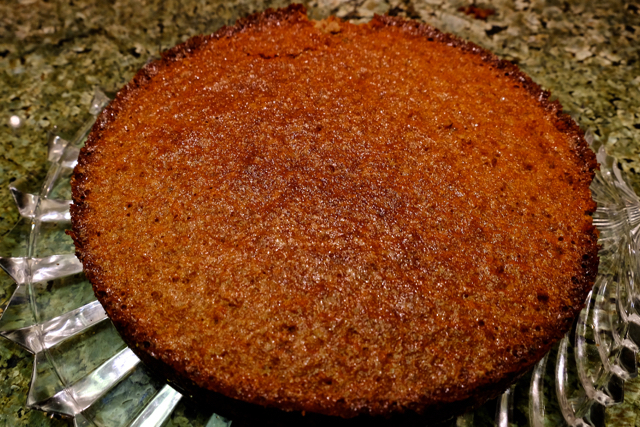 A really interesting torte, with complex walnut notes beautifully offset by the brandy. 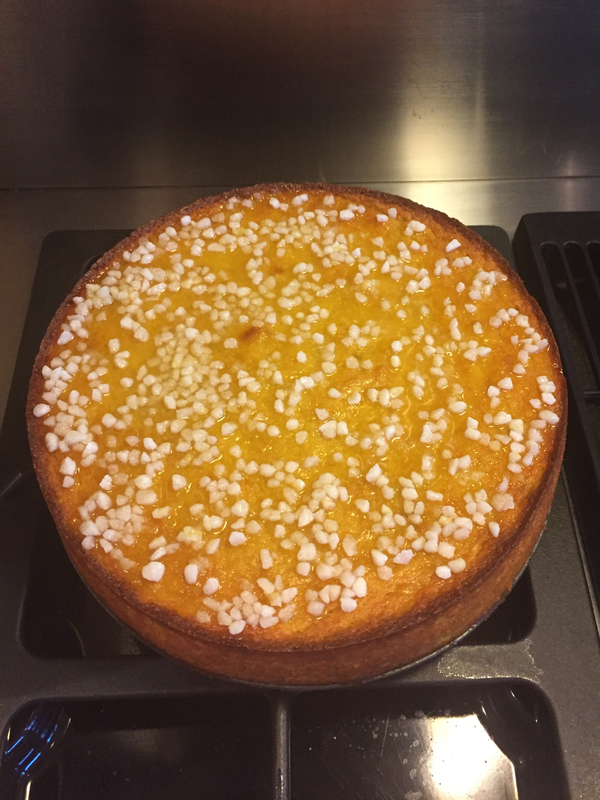 A wet, dense cake -- it doesn't rise because no leavening is used, not even whipped egg whites -- so I served it with a dollop of crème fraîche on top. 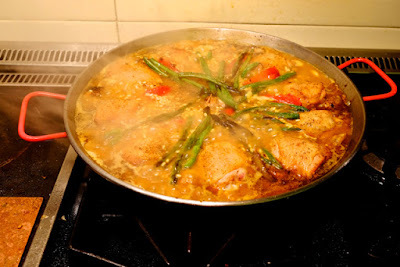 Inspired by the humble paella pan, this was a pretty authentic and really fun dinner. Viva España! Cherries and Berries with GINGER!!! 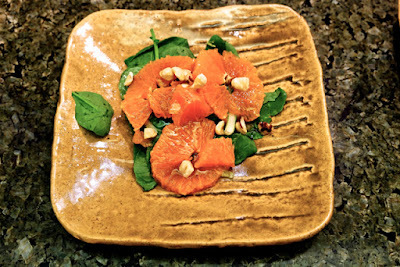 I love, love, love ginger, and I like to use lots of it with fruit. So I grabbed a beautiful bunch of early but sweet and firm cherries from Washington and some Florida-grown blueberries, and concocted dessert. I pitted the cherries and cooked them in a small amount of Monin Ginger Syrup, with a dusting of powdered sugar and a nice pinch of powdered ginger. 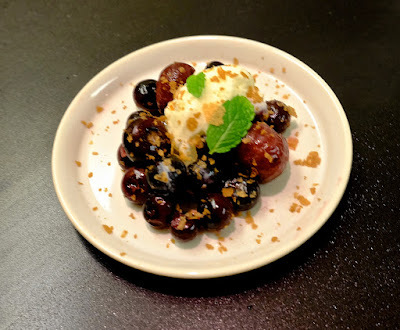 When the cherries were soft but maintaining their shape, I folded in blueberries and diced organic (spicy) candied ginger. Then served it with ginger ice cream that I made with fresh ginger into which I also folded diced candied ginger. So there you have it: ginger syrup and powder, candied ginger, and ginger ice cream (containing fresh and candied ginger). Four or five forms of ginger, depending on how you count. Need I say the dish was excellent, bursting as it was with cherry, berry and ginger tastes? How could it not be if you're a ginger lover? I haven't been posting lately, but I have been cooking, although not for any extravaganza. 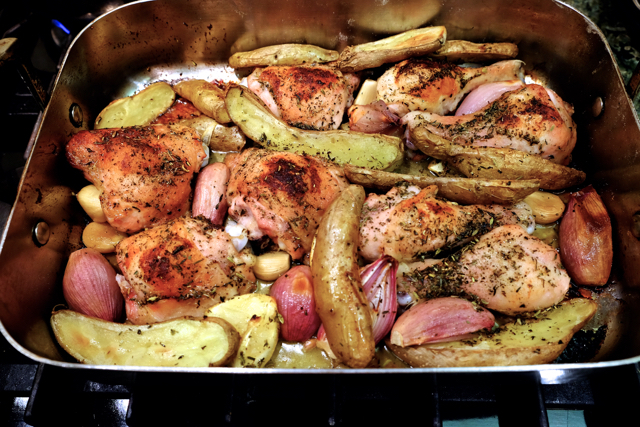 We had a friend for a simple Sunday meal, and I made the Roasted Chicken Provençal from The New York Times, which has become a go-to one-hour meal for me and, apprarently, thousands of others (this is one of the Times' most popular dishes of 2015). I stick pretty closely to the recipe but add halved fingerling or baby Yukon gold potatoes to the pan while roasting. Why not get the starch course done at the same time? First, Roast Chicken with Sumac, Za'Atar and Lemon, from Ottolenghi: The Cookbook, the breakthrough book that got me excited about Middle Eastern food. 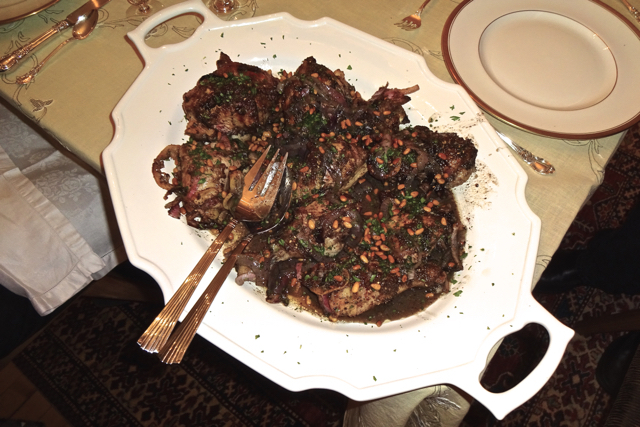 This doesn't look like much from the photo, but trust me, that's the photographer's (my) fault and not the cook's (mine). This and all of Ottolenghi's books are worth the space on your shelves. 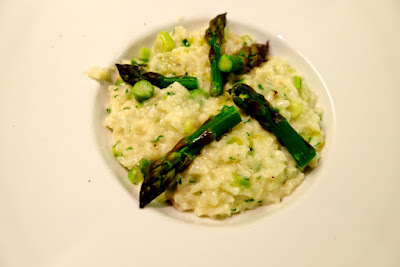 More recently, confronted with magnificent local asparagus at my nearby farmers' market, I made Dorie Greenspan's Cheesy Rice with Asparagus, a risotto-like celebration of this seasonal marvel. Speaking of seasonal asparagus, it is the beginning of that wonderful 6-month period where the local markets furnish us with great and inspiring ingredients, starting with ramps last month and running through asparagus, greens, corn, tomatoes, berries, melons and stone fruit. Time to cook and savor simple things that showcase the natural flavors that our soil give us. I will spend a month of that time in France, where they'll see us and raise us one.